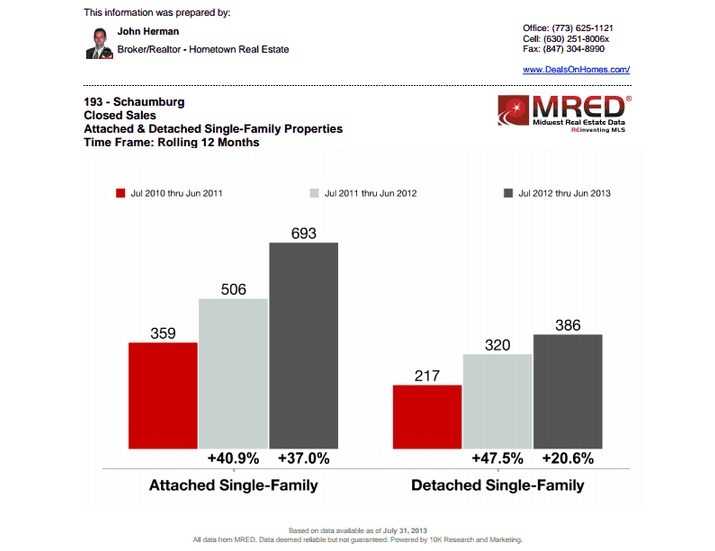 The John Herman team is pleased to announce the latest real estate performance review results for Schaumburg for the year ending June 30, 2013. The number of close sales for detached homes has also increased by 20%, rising from 320 closed sales for the year ending June 30, 2012 to 386 closed sales for the year ending June 30, 2013. The John Herman team is pleased to announce the latest real estate performance review results for Schaumburg for the year ending June 30, 2013. The real estate performance review for homes in Schaumburg showed an increase in the number of closed sales and the median sales price for both attached and detached homes. The number of closed sales for attached homes rose by 37%, increasing from 506 closed sales for the year ending June 30, 2012 to 693 closed sales for the year ending June 30, 2013. The number of close sales for detached homes has also increased by 20%, rising from 320 closed sales for the year ending June 30, 2012 to 386 closed sales for the year ending June 30, 2013. The median sales price for attached homes remained steady at $102,500 for the last two years, but the median sales price for detached homes rose from $230,000 for the year ending June 30, 2012 to $250,000 for the year ending June 30, 2013. The Illinois real estate performance revealed a decrease in the number of homes for sale in Schaumburg. The number of attached homes for sale fell from 415 homes for the year ending June 30, 2012 to 248 homes for the year ending June 30, 2013, and the number of detached homes for sale dropped from 204 homes for the year ending June 30, 2012 to 138 homes for the year ending June 30, 2013. There were mixed results for the number of new listings in the area. The number of new listings for attached homes fell from 987 new listings for the year ending June 30, 2012 to 925 new listings for the year ending June 30, 2013, while the the number of new listings for detached homes increased from 584 new listings for the year ending June 30, 2012 to 603 new listings for the year ending June 30, 2013. The year also showed a drop in the month’s supply of inventory for [Schaumburg homes for sale The month’s supply of inventory for attached homes decreased from 11.5 homes for the year ending June 30, 2012 to 4.6 homes for the year ending June 30, 2013, and the month’s supply of inventory for detached homes dropped from 8.9 homes for the year ending June 30, 2012 to 4.3 homes for the year ending June 30, 2013. There was some improvement in the market time for homes in the community. The number of days attached homes remained on the market dropped from 174 days for the year ending June 30, 2012 to 119 days for the year ending June 30, 2013 and the number of days detached homes stayed on the market fell from 146 days for the year ending June 30, 2012 to 118 days for the year ending June 30, 2013. John Herman, Hometown Real Estate is considered the Best Barrington real estate broker, who serves the entire city of Barrington and its surrounding areas. He has more than twelve years of experience in the local real estate market and is dedicated to providing his clients with exceptional services that assist them in obtaining the right home, for the right price. He holds a Master’s Degree, as well as, an Accredited Buyer Representative Certification, a Short Sale Foreclosure Resource Certification, and is an Equator Short Sale Certified Platinum Member. His decade long commitment to providing each customer with individualized and prompt customer services has earned him the Five Star Professional Award for the past three years. In fact, his customer service ratings were so high, that John Herman has been ranked among the top 2% of real estate agents in the Greater Chicago Area. This distinguished honor speaks volumes about his strong commitment to his clients and his dedication to providing optimal services.